It's a new day. I'm beginning 2013 with an initiative called the Domino Drawing Project-a year long endeavor to create one small drawing or collage a day. Fueled by favorite plant forms, musical rhythms, reading, woodland walks, excursions around town and desire-my intention is to make and find relationships between each successive image and carry them forward through color, form or content. Another desire is to participate in a more rigorous dialogue between observation, ideas and execution. Just 15 days in and it’s already got a hold on me-today while walking across a field of frozen snow with open sections of black dirt tumbled with sticks and dried leaves-I imagined the earth as a large ink drawing and pictured the open ground in front of me in varying hues of black and gray sketched line. 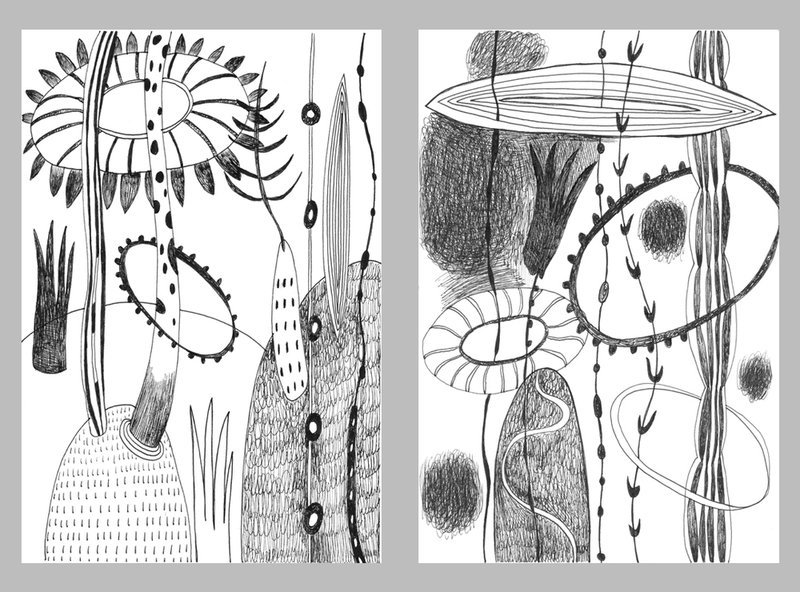 Daily drawing is a good catalyst to work through ideas-new, fleeting and those long on simmer. I also like that drawing, my first true love, is getting more attention. Right now my favorite tool is a black fine-point pen but I look forward to experimenting with new materials in the coming weeks. January 2013. 31 days. Ink, collage and pencil. March 2013. 31 days. Ink, watercolor and collage. June 2013. 30 days. Ink and paper.